Rear end bicycle collisions account for up to 40 percent of all bike accidents in the U.S. according to a recent study conducted by the League of American bicyclists. This is certainly true in urban areas of California, like Los Angeles where bike lanes are not as prevalent as they should be and where motorists fail to share the road like they should. As an attorney that represents bike accident victims, I thought I would share some of the more common rear end bicycle mishap scenarios with you and what you can do to protect yourself as a cyclist. The Swerve Into The Lane: California law requires cyclists to attempt to ride to the right as much as “practicable” but, allows bikers to “take the lane” when they encounter road defects like potholes, road debris or other roadway hazards that make it unsafe to ride along the right hand edge. Rear end collisions can and do occur, though, when the cyclist comes into the lane of travel too quickly. Avoiding this type of bike accident requires that the biker stay alert to the road ahead and make frequent checks to the rear prior to taking the lane. In addition, you should never move left without signaling. If necessary, stop the bicycle and allow traffic behind you to pass. The Distracted Cyclist: In order to ride a bike safely in an urban environment like L.A., San Diego or the bay area, you need all your senses all the time. This means sight, hearing and feel. Riding with headphones that drown out the sounds of engines coming up from behind and other similar “distracted cycling” conduct can lead to being struck in the rear of your bike, toppled and seriously injured. Bike Lane Intrusions: Let’s face it, drivers of cars and trucks and even motorcycles do not always obey the rules of the road when it comes to people on two wheels that are traveling at a slower pace. Bike lanes are supposed to be a place where a cyclist can find refuge from being in close proximity to cars. However, we all know that too many drivers ignore the rules and enter into bike lanes in anticipation of turning right or parking. Stay alert even in the bicycle lane! Intersection Bike Wrecks: Intersections are the main area where bicycle collisions occur. As you approach an intersection, make frequent checks to the rear of your bike. If you remain to the right, look for cars attempting to make abrupt right hand turns. Don’t hug the curb but, provide yourself some space to move further right in the event of a rear-approaching vehicle especially large trucks and sport utility vehicles. Bicycle Collisions from Behind After Dark: Many rear end strikes occur during the night time hours. Visibility is key here. California law requires that you have both reflectors and lights on your bike if you intend to ride a bicycle after dusk. You should always go above and beyond these requirements by wearing reflective clothing and as brightly colored apparel as possible when traveling at night. Hopefully, you will use these and other techniques to avoid being struck from the back end of your bicycle. Unfortunately, due to inattention on the part of drivers and sometimes outright hostility, rearward cycle mishaps can and do occur especially in areas with heavy traffic like Los Angeles, Orange County and San Diego. 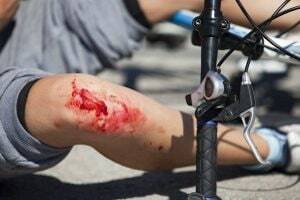 Getting hit from behind on a bike can cause the cyclist to be thrown into the air, lay the bike down, being run over while on the pavement, or many other scenarios resulting in major impact to the body. This can result in serious injuries like fractures the the arms, legs or pelvis. The first priority in these situations is seeking immediate medical attention. After trauma care is received, the next priority should always be consulting with a lawyer who is familiar with rear end bicycle collision claims prior to making any statements to auto insurance representatives. Having a legal advocate and buffer can mean the difference between being stuck with medical expenses or being able to receive full and complete compensation for injuries. A quality injury attorney can assess the facts, investigate the scene, speak with witnesses and even hire experts, if necessary, to reconstruct the incident and analyze the legal issues of fault.